DBTY! 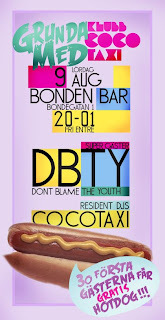 : DBTY @ Bonden Bar Saturday! So Cocotaxi (!) - one of the most awesome dj-crew:s in Sthlm - invited us over to their lovely bass-drowned club at Bonden this saturday. This happening, or whatever one chooses to call it, will be a war - in the most positive sense of the word. There will be hundreds of us behind the decks, this is a song that pretty much says everything about this week-end. A little dedication to our friends The Coco Kids!